Nice! Should it not have help-portrait.com on it as well? (their website?) That would be great marketing/create awareness..
Website would be a great idea, but it is really geared more towards the people who are volunteering or those who want to donate. Since the people we are serving will be seeing the shirts all day, I'm not sure if it would accomplish our purposes to have them visit the website. Rather, they will see the name of the organization and simply remember who gave them a great experience. That, and we were trying to keep it simple ??? That's my take anyway. Feel free to comment. 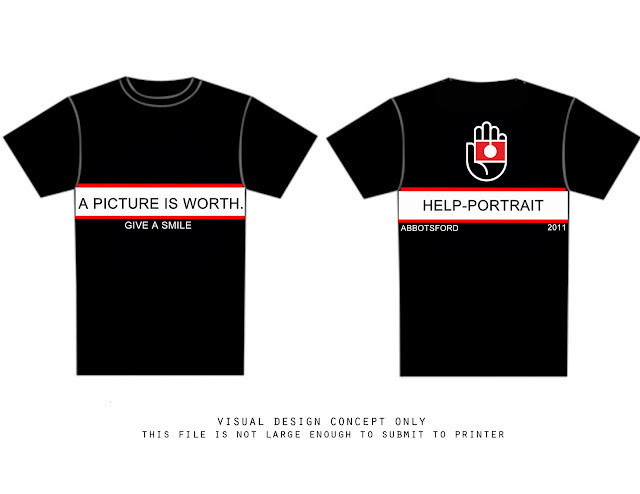 so, just to clarify (in a sassy tone), we are going to have the words, "give a smile" written across our form fitted tshirts?